I can now announce the project I've been working on for the last week or so. 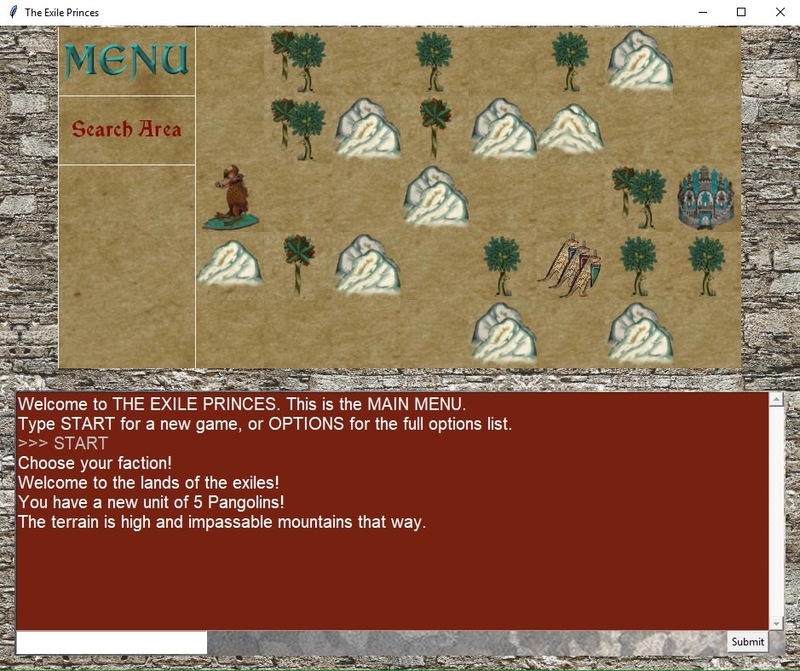 This would be my entry for the Exile competition, but I'm judging it so obviously it isn't being entered, and indeed I'm a long way from finishing it... anyway, I present to you my new game, the Exile Princes! 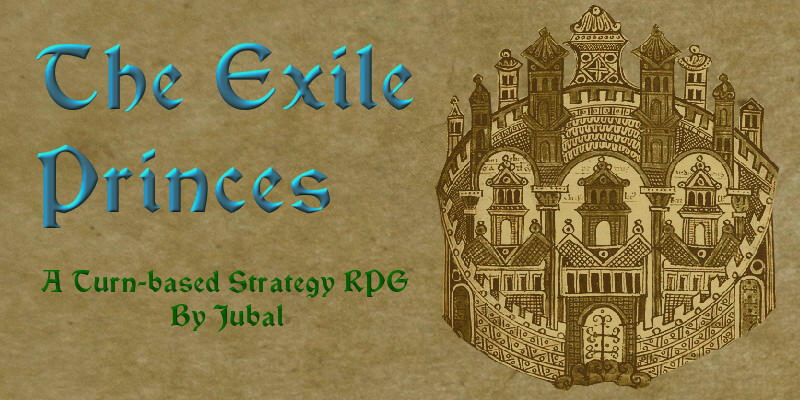 The Exile Princes is a turn based strategy/RPG where you traverse the Exile realms with your warband/army and search for lost treasures, fight enemies and monsters, and ultimately attempt to ensure the supremacy of your house. 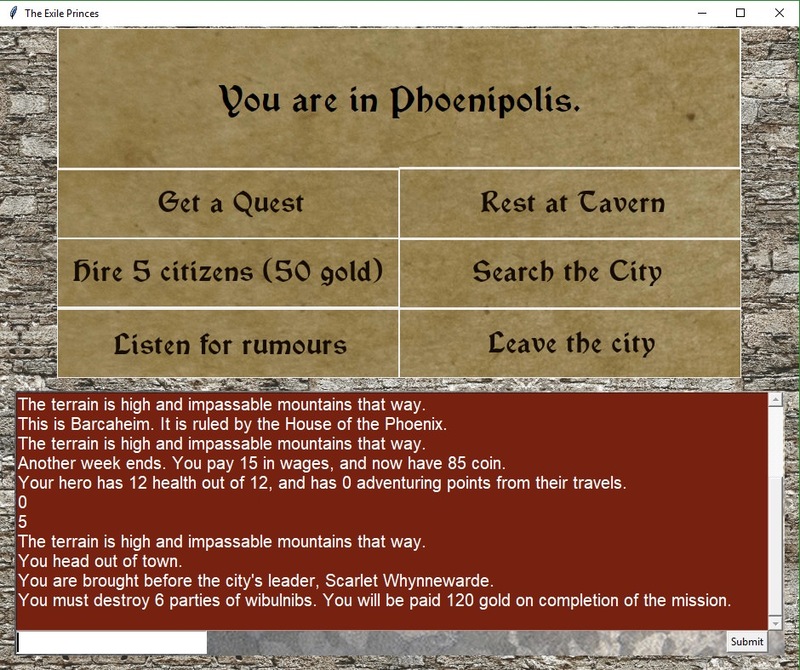 The end goal of the game is to have all the cities on the map recognising your superiority, which can be done in a number of ways - getting yourself named as the city's protector by proving yourself in its service, or winning control of the city through political intrigue, or simply capturing the city by force. The four different factions in the game each have a distinctive theme, ideas, and playstyle which will lend themselves to different approaches to this ultimate goal. The monsters, tileset, and world of the game are a mixture of medieval art and Exilian references, creating a unique madcap world in which the exile realms are roamed by herds of whooping quarquares, packs of clawed wibulnibs and families of boar-like tusked kinklades. The tileset itself is created mostly from medieval bestiaries and manuscript art. The House of the Phoenix train their leaders to be courageous, pure, honest - riding their mighty war cockerels, they are great heroes of the Exile Realms, the gryphon-tamers and manticore-slayers whose banner brings. The Phoenix are a bold house, with ambition to reform and reunite the Exile realms - the young and the brave look to them for leadership, for wherever the phoenix banner flies, there lies hope. The House of the Phoenix focusses on the player's hero character. A boost to starting initiative means that your leader will get to attack first, and that alongside a bonus to adventuring points gained from quests means that Phoenix heroes will gain stat points faster than any other hero type, with a unique "heroism" stat upgrade that adds to both attack and defence. The Phoenixes also have a special unit tree of bird units, with two branches - one of tougher ground-attack birds, and one of lighter, faster flying birds, including the mighty phoenix itself! The House of Generals prize strength, decisiveness, and victory. Prepared to defend the liberty of their cities at all costs, they may have the military might to forge and build a world of peace beyond the horrors that plague the Exile realms. Many folk place their hope in the House of Generals, for they above all others will hold the line against those who would shatter their fragile world. They are the cold steel that guards, the stone wall that shields, and it is their soldiers who may be marching towards the future. The House of Generals can get the best military power in the game. Their key special ability is to give all unit types an attack boost based on their general's leadership, meaning that later in the game their units can dish out exceptionally high-powered attacks. They also have one of the most powerful ranged units in the game - the arquebusier - as a unique unit, upgrading one of a range of other unit types using their hero's adventuring points. The House of Dragons play the game of life slowly, carefully, and to win. Their treasuries overflow with gold, and whether they choose to go to war, to adventure, or to politics, they are ready to spend their vast wealth in the pursuit of their goals. Peace-lovers and those who want a quiet world often favour the dragons, preferring smooth gold-brokered diplomacy to the clash of battle or the call of adventure. They are the keepers of flames, the gold-lords, who bring fire against the cold - for when the night is coldest, and the world is poorest, the roar of the dragon is the roar of returning life. Nobody knows gold better than a dragon! Players with the House of Dragons get a percentage bonus to their gold each week, and can sometimes expend adventuring points to earn bonus gold as well. The Dragons can thus field larger armies (or buy bigger bribes) than any of the other factions. The House of Scholars are the oldest of the Exile houses; reluctant leaders but fierce believers in democracy and learning, they see their twofold role as leaders and teachers as a path of duty. Misfits, the forgotten, and the dispossessed tend to flock to the pangolin banner of the Scholars. They are the seekers after truth, the friends of forgotten things. While there is free air to breathe and a wide world to discover they stand ready to walk in the darkness - and so find the light. The Scholars' bonuses are primarily to searching - they find it much easier to get results from searching an area for treasures or hireable units - and to information gathering, giving them advantages when digging into the political intrigues of a city. They can also do well at unit training thanks to their unique unit, the pangolin, a medium infantry unit that can add XP to other units based on how much they have earned. Auesum! Why not let G judge the thing so you can win? The inspirations for the houses are obvious - other Exilian folk will have other references ingame too though. The boar-like creatures you can see in the first screenshot are the "tusked kinklades", and you can meet Caradilis as a search result in the forest areas of the map (she sells you potions). And there are wibulnibs to fight everywhere. 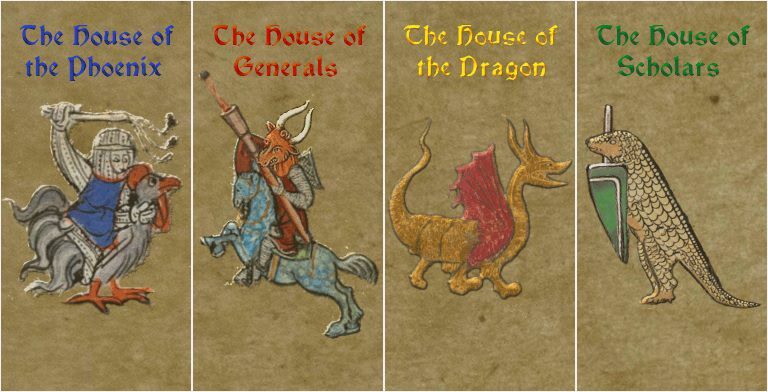 The NPC cities can also be House of Princes and House of the Wolf, but I haven't got any decent ideas for making those playable and don't want to overstretch my plans toooooo much until I've got a release out. Honoured to get a mention too. I'll feel a bit weird playing it, mind you, if I have to roam the land slaughtering herds of myself! What is this blasphemy? How are the wibulnubnibs not recognised bas the true and rightful rulers of this strange land? To arms my fearless wibblers! For death and nibbles! I believe Marcus had something to do with it. Just had a live playtest session with CG, who I regret to inform everyone has been killed by a manticore. Well that is exciting and tragic news, in that order. Hopefully you got some valuable feedback before he snuffed it? I did The main bit being that I need a minigame for battles of some sort. I'm thinking of having a four-part screen so both you and your opponent can have 1 unit in each of attack and defence (which can be the same unit), which you can swap round, with stamina losses to stop you keeping your best ones out all the time, and then some options like "flee", "fight next round", maybe occasional special abilities, etc. Does that sound decent? Yeah that sounds like a good idea to me. So would it be turn based with you chosen units squaring off in a sort of ff RPG stylee except with army troops? Yeah, exactly. I feel like the next step up from that would be a full tactics engine which seems excessive for the style of game. The main news is that we now have a battle system set up! You can choose your attack and defence units (which can be the same unit or separate) - attack position gives units the chance to gain XP, defence is what takes the pain. So you can just put your best attacker in attack and your best defender in defence? Well, not permanently: being either in attack or defence drain's a unit's resilience, a new stat added to the game. Units that go below 0 resilience start taking stat penalties, hampering their ability to fight. Even veteran warriors or huge monsters, if exhausted from too many rounds of fighting, can be taken down by a unit of fresher but less well trained troops. You'll also be able to expend extra resilience with some troop types to activate powerful special abilities, though that's not implemented yet. There have been other additions too - I've added more to the cities, so you can now use the "listen for rumours" button more usefully to discover info on the city's different districts, and you'll also get a free "first impression" line every time you walk into a city, which will give you a basic idea about how diverse and how wealthy the city is - cities that value a more pluralist society, or have deep poverty that needs tackling, will want rather different leadership to those that are exorbitantly wealthy, or those that have very traditionalist cultures. 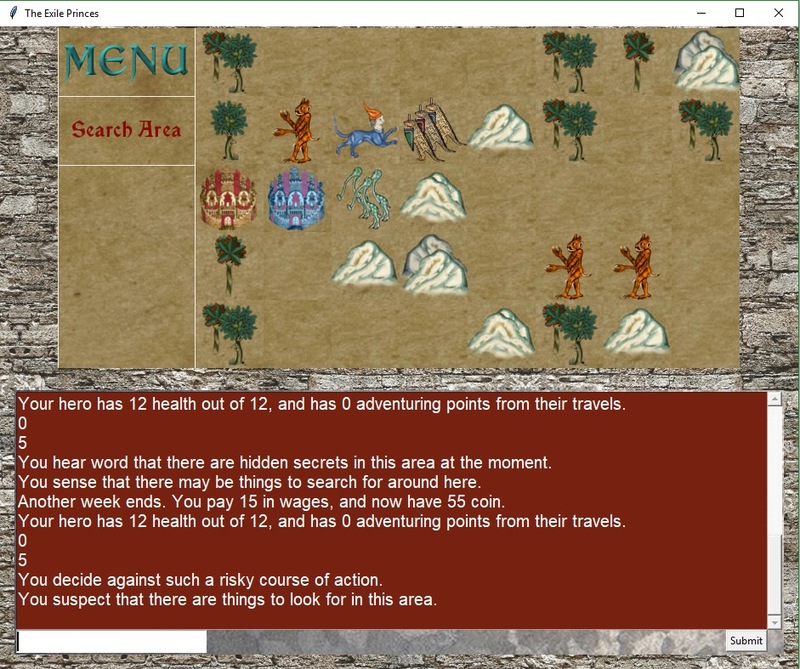 I'm not sure what to work on next - more quests, more city detail, further combat improvements, more unit/enemy types, more diverse terrains etc on the map, more search functions... the possibilities are dauntingly endless!